A photo of the army personnel taken by a passerby last month. THE IRISH GOVERNMENT complained to the United States Embassy in Dublin last month after American army personnel were spotted wearing their uniforms in Shannon town without having received approval. 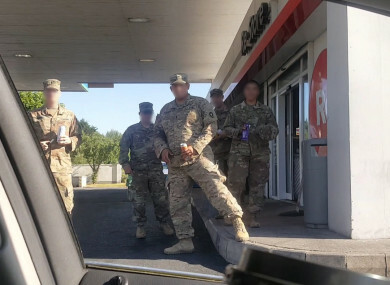 A photo purportedly of three US military personnel in full uniform outside a service station in Shannon town was posted on social media on 26 June. Tánaiste and Minister for Foreign Affairs and Trade Simon Coveney has now confirmed these soldiers did not have permission to wear their uniforms outside Shannon Airport. A section of the Defence Act 1954 prohibits the wearing of a foreign military uniform in the State without express ministerial permission. Permission was granted in 2003 by then Minister for Foreign Affairs Brian Cowen to allow military personnel to wear their uniforms in the transit areas of Irish airports, including Shannon Airport. However further permission must be sought for the wearing of uniforms outside these areas, for example for attendance at official meetings or diplomatic events in the Irish State. Where permission is granted, conditions under which uniforms may be worn are set by the Department of Foreign Affairs and Trade. In response to a parliamentary question from Independents 4 Change TD Clare Daly, Coveney confirmed these conditions were “not strictly adhered to” on 26 June in Shannon. He said his officials raised concerns with the US Embassy the next day, “emphasising the necessity for strict compliance with the criteria”. “My department has sought, and received, assurances that the embassy is strengthening its measures to prevent any recurrence,” he said. Daly described this incident as “very serious” and said the image of foreign military personnel in uniform “wandering around the streets was absolutely scandalous”. “Sadly I believe, it’s indicative of an attitude that the US military has, seeing Ireland as almost an outpost of the US, rather than an independent state, and a neutral one at that. It’s a small wonder when the government facilitates their virtual monopolisation of Shannon Airport,” she said. She said credit was due to Shannonwatch activists and local residents who had exposed the incident. The United States Embassy said it is addressing the situation. In response to a query from TheJournal.ie, a spokesperson for the United States Embassy said the US government appreciates and respects the conditions under which aircraft transporting members of the military can use Shannon Airport in accordance with Irish law. Minister Coveney said his department regularly receives requests from various states for the wearing of military uniforms. Last year there were 67 uniform requests granted by his department – up until 29 June this year, 41 have been granted. Email “American soldiers wore uniforms in Shannon town without Irish government approval ”. Feedback on “American soldiers wore uniforms in Shannon town without Irish government approval ”.